While many students used the recent break as a chance to unwind after a long and taxing semester, that was not the case for the wrestling team, which had a busy winter schedule. The group used their trips to Williamsport, Pennsylvania and Ft. Lauderdale, Florida as an opportunity to come together. Although the team had already participated in several matches during the fall semester portion of their winter season, they had the advantage of being able to focus on solely wrestling over the College’s recess, which was hard to do in the early part of the season. Challenges the student athletes faced include balancing their athletic commitments with a full collegiate course load, and many members of the team were simultaneously grappling the standard first year challenges, such as the adjustment to living away from home for the first time. “[The trips] were a very beneficial experience, mainly due to the fact that there was lots of tough competition at hand,” said Angelo Mahaffey ‘22. “The trip was also a great bonding experience, when we weren’t supporting each other from the corner, or even wrestling at that, we were relaxing in the Florida sun. We even rented our own house to aid in the bonding experience. We played card games, conversed and all around grew closer,” added Mahaffey. Despite the fun the team had both in and out of the gym, it was not easy for the wrestlers to be away from their families over the vacation and retain the same level of intensity they had during the semester, as they already had a large part of their grueling season under their belts, along with the fatigue from their dual commitment to wrestling and their academics. Dylan Schwartz ‘20 shared what he found most difficult about missing the holiday season at home. “Break is always the toughest part of the season. It’s tough for everyone to be away from home for most of break and working hard every day” said Schwartz. One of the main reasons the team enjoyed the trip so much is because of second year coach Jason McLean ‘01 at the helm of the program. The emphasis around the team’s assets as opposed to possible weaknesses not only boosts players’ individual confidence, but it is a large contributor to the team’s collective spirit. “Coach McLean always puts a positive spin on our performances and makes it easier for us to see what we did right rather than what we did wrong,” said Schwartz. The junior 165 lb. wrestler also indicated the attitude that Coach Mclean maintains around the team is a large reason for their 17-6 overall record thus far. Although the results were not exactly what the team had hoped for, the bonding experience will hopefully aid the wrestlers’ success throughout the remainder of this season. The team has remained busy since their return from the Sunshine State and started off 2019 with trips to Ewing, New Jersey to battle the #15 The College of New Jersey and #18 New York University falling in both matches against the nationally ranked opponents. They rebounded at the North/South Duals against Elizabethtown, Rhode Island College, Penn College, and Shippensburg, winning each match in Collegeville, Pennsylvania. 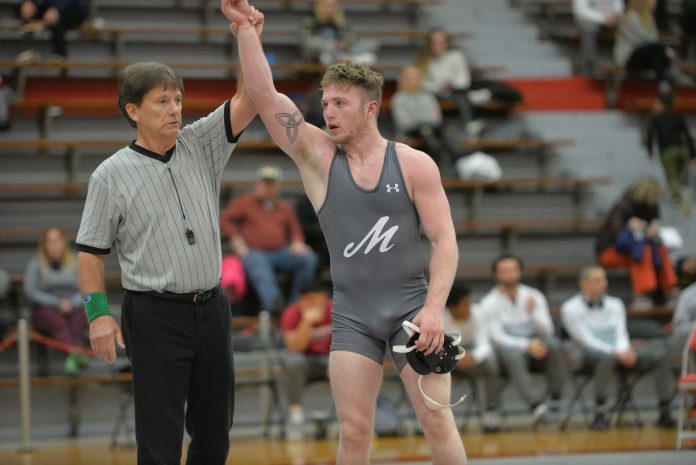 The Mules have matches this coming Saturday, Feb. 2 in Grantham, Pennsylvania, where they will participate in the Messiah Open, and again in Collegeville, where they will face Gettysburg and McDaniel. These will be the only two matches before the Centennial Conference Championships on Feb. 9.